Only One, Free Talk, and Beautiful Silence, a photo by timtak on Flickr. I went to my son's school open day last Saturday. We were allowed to view a typical class. In an attempt to encourage individualism among Japanese primary school students, the text of SMAP's "The only flower (like you) in the world" (sekai ni hitsu dake no hana translated) which encourages us to realise that we are the "only one" like ourselves, and appreciate and nurture our natural beauty, abilities and aspirations. The lyrics are displayed above the blackboard in this Japanese primary school. The children sang it in unison, very loudly at the start of class. After singing the SMAP homage to individualism, the pupils are encourage to participate in "furi- toruku" (free talk) which is highly structured and anything but "free." Students were allowed to express a preference and then call on another student to express one of their preferences. Only those addressed were allowed to speak, briefly. Later in the day, every day, the pupils, are required to clean the classroom as a group in complete silence. The school is aiming to carry out the most silent classroom cleaning in Japan. Toruku (talk) is thus situated as something that should only be carried out in its proper place and only when addressed. At other times it is a distraction that is best eradicated. At the school open day, at the end of the presentation regarding the schools pedagogy to the assembled parents, there was scheduled ten minutes for questions. After 15 seconds of silence, and not one question from the parents, the meeting was closed. While the SMAP song does encourage individualism it uses the metaphor of beautiful flowers. I believe that Japanese students are encourage to appreciate and nurture their individual beauty, abilities and dreams as conceived in the imaginary, visual domain. In Japan talk is not "free", it is cheap. 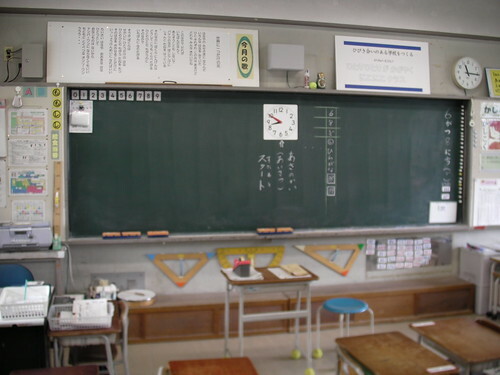 The photograph is blurred so that the names of the children posted below the blackboard can not be read. Very well written. As soon as I read, "In an attempt to encourage individualism among Japanese primary school students... The children sang it in unison, very loudly at the start of class" I knew you were an author who's seen 'the real Japan'. God help us all, all of us here.